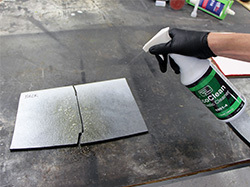 This SOP will guide you through the process of repairing a crack or hole in a Metton® (DCPD) panel. This plastic is a rigid material often used for large hoods on heavy trucks and farm equipment. It is a thermoset material and is not meltable. An adhesive repair must be performed. 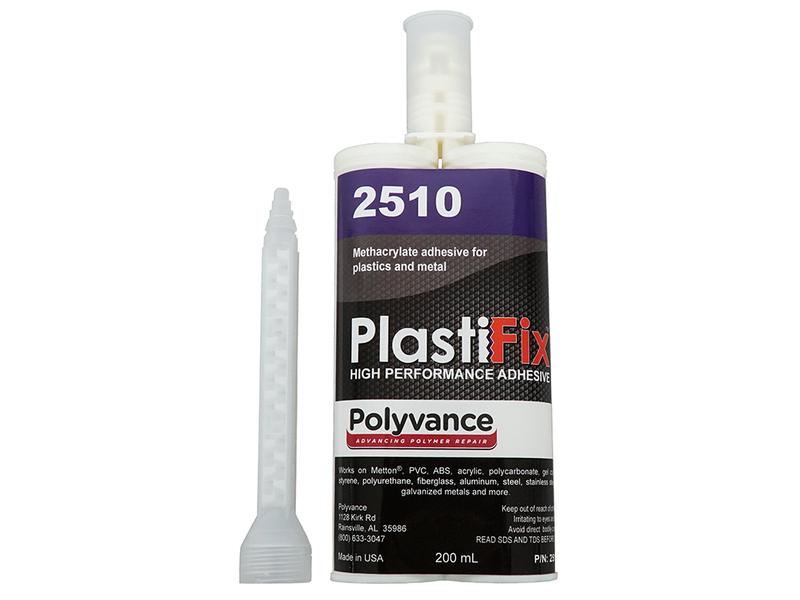 2510 PlastiFix High Performance Adhesive is a two-component, 100% reactive structural methacrylate adhesive specifically formulated for bonding thermoplastics, thermosets, metals, and composite assemblies. 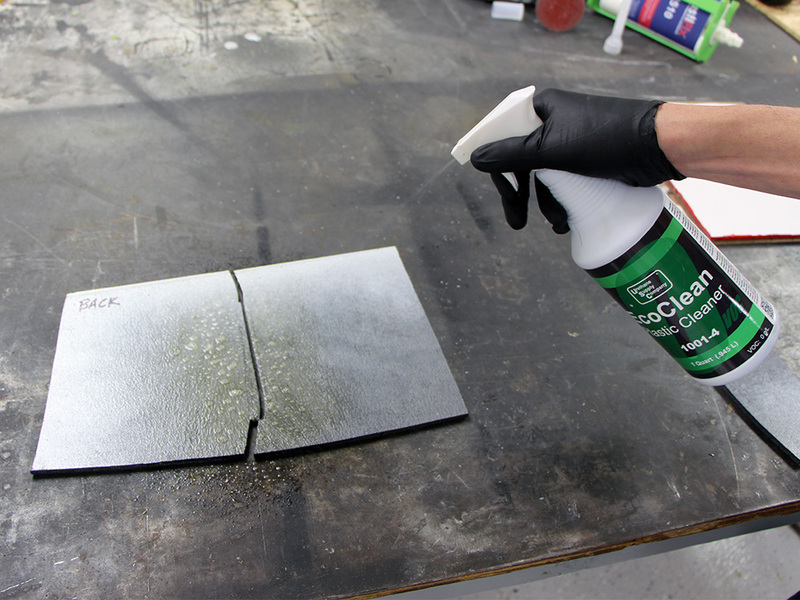 Clean the plastic with 1001-4 Eco Prep or 1000 Super Prep plastic cleaner. Spray a heavy, wet coat, allow it to sit on the surface for 5-10 seconds to dissolve contaminants, then wipe with a clean paper towel. Use 6485 Aluminum Tape on the frontside to hold the crack together and keep adhesive from flowing through. Rough grind an area on the backside about 3” (8 cm) wide with a 36 to 50 grit abrasive disc. Remove paint completely. 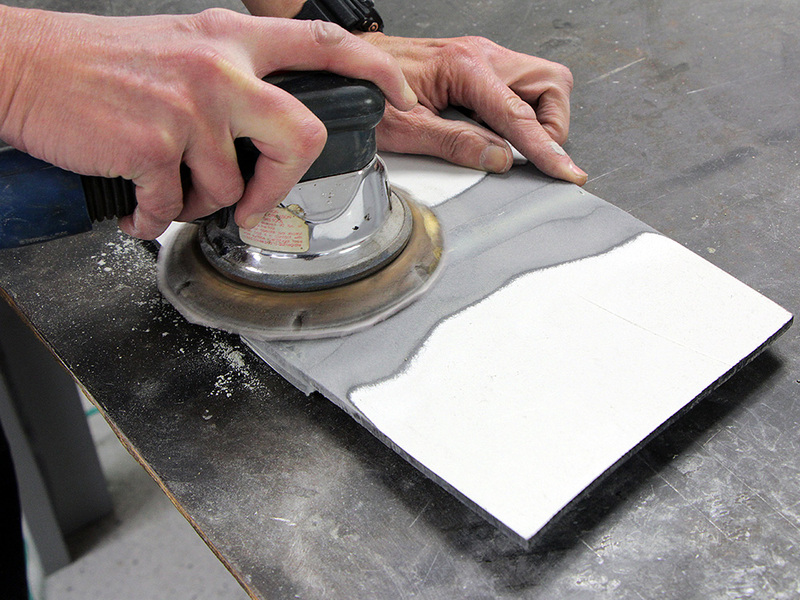 If you are using a backer plate to reinforce the backside, grind the surface to be bonded as well. A good sandscratch will enhance mechanical grip of the adhesive. Blow dust free with clean, dry air. 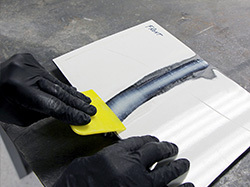 Place a 2510 PlastiFix two-part methacrylate adhesive into a cartridge gun, open the tip, and squirt out a bit to balance the sides. Thread on a static mixer tip. 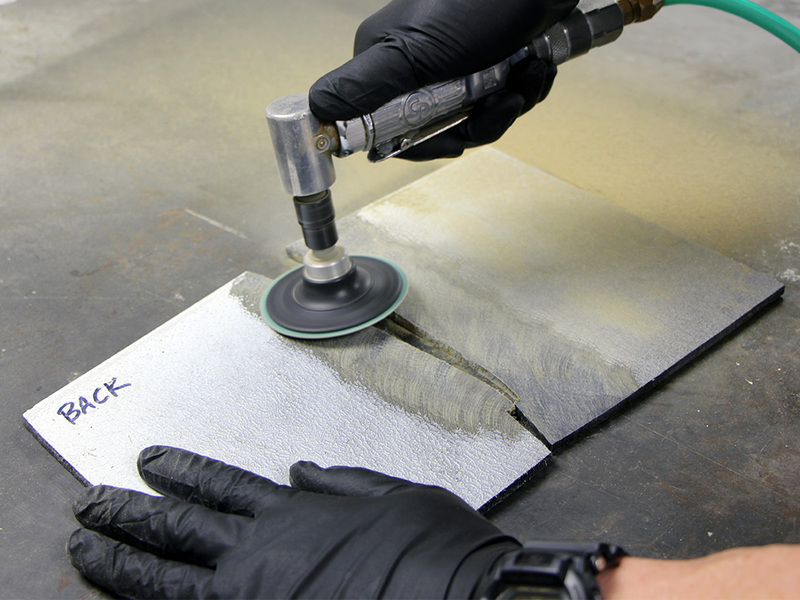 Apply a liberal amount to the area on the backside where the backer plate will be bonded or the fiberglass cloth will be imbedded. Leave the mixer tip on the adhesive cartridge when you are done. Use a body spreader to spread the adhesive evenly over the backside. Press down to work the adhesive into the sandscratches and remove any air bubbles. 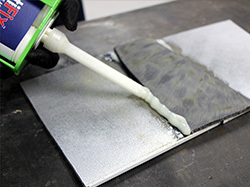 Reinforce the backside by applying a backer plate or by imbedding fiberglass cloth into the adhesive. 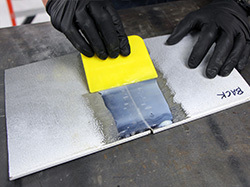 Run a bead of adhesive along both edges of the backer plate and smooth it out with a gloved finger. 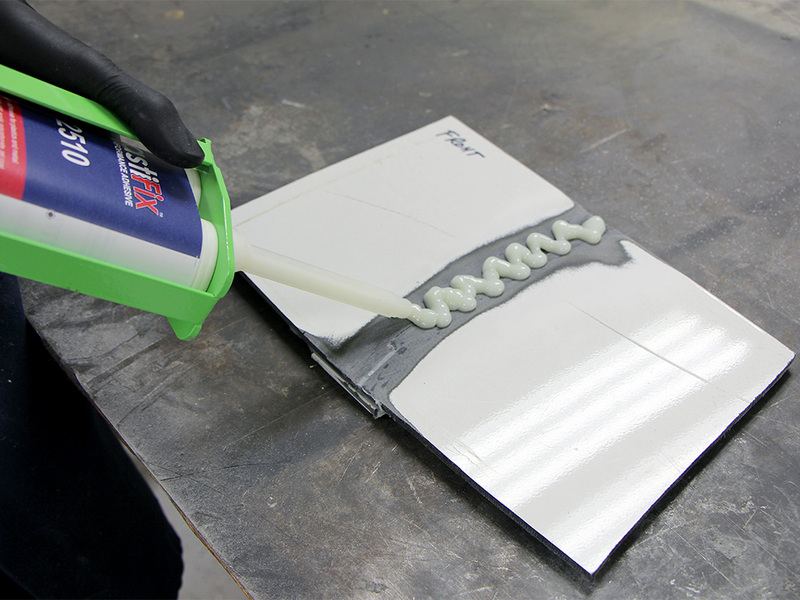 Allow the adhesive to cure for one hour before working on the other side. Peel the aluminum tape off the frontside. 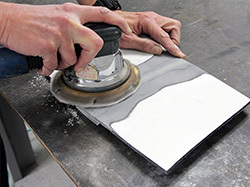 Use a straight die grinder with a 6122 ball-tip carbide burr to dig a channel about 1” (2.5 cm) wide along the crack on the frontside. 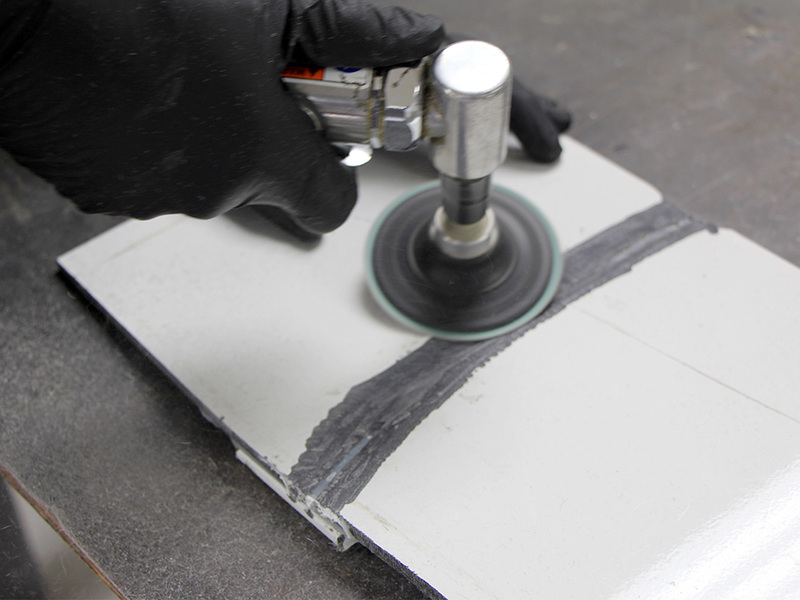 Then use a 36-50 grit sanding disc in an angle die grinder to sandscratch inside the v-groove and to feather back the paint. Finally use 80 grit in a DA orbital sander to feather the paint back farther. Blow dust free with clean, dry air. 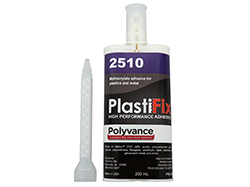 Thread a new static mixer tip onto the 2510 PlastiFix adhesive kit. Apply a liberal amount to the area in the v-groove. Use a body spreader to smooth the adhesive into the v-groove. Allow one hour for it to cure before sanding. Sand with 80 grit in a DA orbital sander. 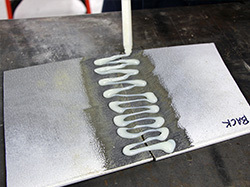 Fill any remaining low spots with 2020 SMC Hardset Epoxy Filler for best results. Finish sanding with 180 grit, then prime with 3041 All Seasons Light Gray Waterborne Primer-Surfacer or 3043 All Seasons Black Jack Waterborne Primer-Surfacer.